Google China has recently released an experimental version of Google Toolbar for Internet Explorer that includes a lot of interesting features, but it's only available in Chinese. The most exciting new feature is an integration with Google Translate that allows the toolbar to translate web pages that use AJAX extensively and even web sites that require SSL. 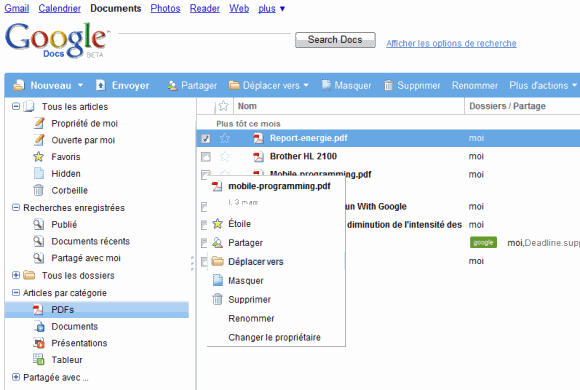 And here's an English-to-French translation for Google Docs. As you can see, Google Toolbar translated the navigation bar, the sidebar, the list of documents and even the contextual menu. When you use the interface and select an option, Google Toolbar detects the changes and translates the new messages almost in real-time. When you use this feature for Google Reader, the toolbar translates all the posts as they are loaded. Another interesting feature from the new experimental version of Google Toolbar is a sidebar for Google Bookmarks that brings many of the features that are already available in GMarks, a popular Firefox extension. If you speak Chinese and you use Internet Explorer, try Google Toolbar, Labs Edition while keeping in mind that it's not a finished release. It's an interesting experience to use a software in a language you don't know, so you could try the toolbar even if you don't understand Chinese. For now, the toolbar is only available in Chinese, but the translation feature works for all the 41 languages supported by Google Translate (the main challenge is to find a specific language name). This is certainly the most advanced use of the Google Translate API and it shows that automatic translation is a feature which becomes even more powerful when it's integrated in the browser. I'll go and have a try! Cool! Hope it be a global toolbar feature soon! very interesting if there are real time google translate.